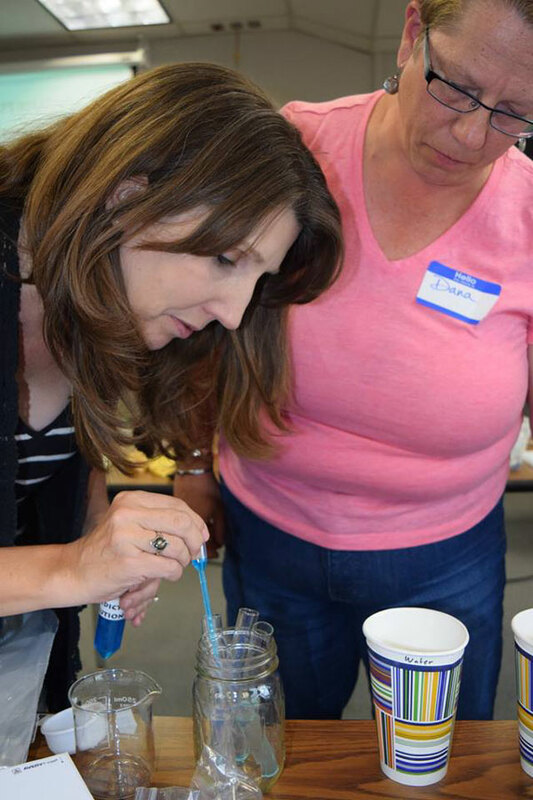 Teachers learn a hands-on activity to understand the role of enzymes in biofuels. Jack McLeod wants to make sure his students know there are many alternatives to fossil fuels. As a science teacher at Cascade High School in Everett, Washington, he is well-versed in the possibilities for liquid biofuels like ethanol, bio-gases like methane, and solid biomass material, and he is eager to provide more information to broaden students’ perspectives. “I want my students to know that new practices come about with new technologies and that engineering is key to solving problems,” said McLeod. McLeod and other Puget Sound area science teachers took part in a day-long energy literacy and bioenergy workshop sponsored by Advanced Hardwood Biofuels Northest designed to give teachers more tools to integrate biofuels into their classroom. “Bioenergy is a topic that cuts across many disciplines such as biology, chemistry, earth science, engineering, technology, and economics,” said workshop facilitator Brian Hartman from Oregon State University. “Because of its relevance to energy independence and its role in reducing greenhouse gases, it is also very relevant to students.” Hartman, a doctoral candidate in science education, is part of the Science & Math Investigative Learning Experiences (SMILE) program providing educational programs with the Advanced Hardwood Biofuels Northwest (AHB) consortium. Teachers measure liquid for a bioenergy experiment to take back to students in their classrooms. 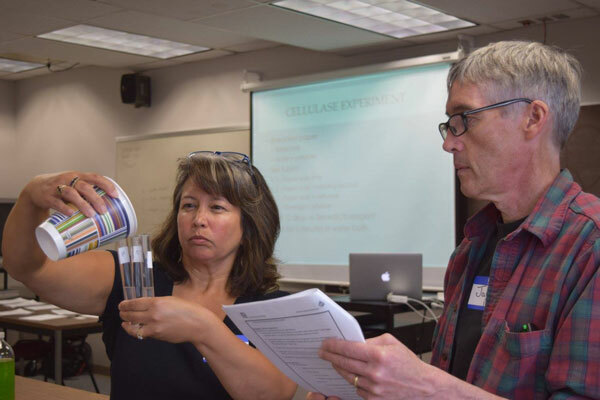 Hands-on experiments with fermentation, enzymes, microbial fuel cells, and biodegradable utensil design, took teachers through the process of analyzing and interpreting data to bring home the message of bioenergy possibilities at the July workshop in Shoreline, Washington. The AHB bioenergy education initiative develops, tests, and makes available high-quality activities to allow easier integration of lab activities into the science classroom. Each experiment is designed with the “Five E’s” in mind and provides detailed information on how teachers can facilitate students to Engage, Explore, Explain, Elaborate, and Evaluate.